For other uses, see Syncope. "Fainting" redirects here. For other uses, see Faint. "Passing out" redirects here. For the completion of a military course, see Passing out (military). A medical history, physical examination, and electrocardiogram (ECG) are the most effective ways to figure out the underlying cause. The ECG is useful to detect an abnormal heart rhythm, poor blood flow to the heart muscle, and other electrical issue such as long QT syndrome and Brugada syndrome. Heart related causes also often have little history of a prodrome. Low blood pressure and a fast heart rate after the event may indicate blood loss or dehydration, while low blood oxygen levels may be seen following the event in those with pulmonary embolism. More specific tests such as implantable loop recorders, tilt table testing or carotid sinus massage may be useful in uncertain cases. Computed tomography (CT) is generally not required unless specific concerns are present. Other causes of similar symptoms that should be considered include seizure, stroke, concussion, low blood oxygen, low blood sugar, drug intoxication and some psychiatric disorders among others. Treatment depends on the underlying cause. Those who are considered at high risk following investigation may be admitted to hospital for further monitoring of the heart. Syncope affects about three to six out of every thousand people each year. It is more common in older people and females. It is the reason for one to three percent of visits to emergency departments and admissions to hospital. Up to half of women over the age of 80 and a third of medical students describe at least one event at some point in their lives. Of those presenting with syncope to an emergency department, about 4% died in the next 30 days. The risk of a poor outcome, however, depends very much on the underlying cause. The central ischemic response is triggered by an inadequate supply of oxygenated blood in the brain. The respiratory system may contribute to oxygen levels through hyperventilation, though a sudden ischaemic episode may also proceed faster than the respiratory system can respond. These processes cause the typical symptoms of fainting: pale skin, rapid breathing, nausea and weakness of the limbs, particularly of the legs. If the ischaemia is intense or prolonged, limb weakness progresses to collapse. An individual with very little skin pigmentation may appear to have all color drained from his or her face at the onset of an episode. This effect combined with the following collapse can make a strong and dramatic impression on bystanders. The weakness of the legs causes most sufferers to sit or lie down if there is time to do so. This may avert a complete collapse, but whether the sufferer sits down or falls down, the result of an ischaemic episode is a posture in which less blood pressure is required to achieve adequate blood flow. It is unclear whether this is a mechanism evolved in response to the circulatory difficulties of human bipedalism or merely a serendipitous result of a pre-existing circulatory response. Arterial disease in the upper spinal cord, or lower brain, causes syncope if there is a reduction in blood supply, which may occur with extending the neck or after drugs to lower blood pressure. Vasovagal (situational) syncope is one of the most common types which may occur in response to any of a variety of triggers, such as scary, embarrassing or uneasy situations, during blood drawing, or moments of sudden unusually high stress. There are many different syncope syndromes which all fall under the umbrella of vasovagal syncope related by the same central mechanism, such as urination ("micturition syncope"), defecation ("defecation syncope"), and others related to trauma and stress. Isolated episodes of loss of consciousness, unheralded by any warning symptoms for more than a few moments. These tend to occur in the adolescent age group, and may be associated with fasting, exercise, abdominal straining, or circumstances promoting vaso-dilation (e.g., heat, alcohol). The subject is invariably upright. The tilt-table test, if performed, is generally negative. Recurrent syncope with complex associated symptoms. This is neurally mediated syncope (NMS). It is associated with any of the following: preceding or succeeding sleepiness, preceding visual disturbance ("spots before the eyes"), sweating, lightheadedness. The subject is usually but not always upright. The tilt-table test, if performed, is generally positive. It is relatively uncommon. A pattern of background factors contributes to the attacks. There is typically an unsuspected relatively low blood volume, for instance, from taking a low-salt diet in the absence of any salt-retaining tendency. Heat causes vaso-dilation and worsens the effect of the relatively insufficient blood volume. The next stage is the adrenergic response. If there is underlying fear or anxiety (e.g., social circumstances), or acute fear (e.g., acute threat, needle phobia), the vaso-motor centre demands an increased pumping action by the heart (flight or fight response). This is set in motion via the adrenergic (sympathetic) outflow from the brain, but the heart is unable to meet requirement because of the low blood volume, or decreased return. The high (ineffective) sympathetic activity is always modulated by vagal outflow, in these cases leading to excessive slowing of heart rate. The abnormality lies in this excessive vagal response. The tilt-table test typically evokes the attack. Much of this pathway was discovered in animal experiments by Bezold (Vienna) in the 1860s. In animals, it may represent a defence mechanism when confronted by danger ("playing possum"). Avoiding what brings on the syncope and possibly greater salt intake is often all that is needed. Psychological factors also have been found to mediate syncope. It is important for general practitioners and the psychologist in their primary care team to work closely together, and to help patients identify how they might be avoiding activities of daily living due to anticipatory anxiety in relation to a possible faint and the feared physical damage it may cause. Fainting in response to a blood stimulus, needle or a dead body are common and patients can quickly develop safety behaviours to avoid any recurrences of a fainting response. See link for a good description of psychological interventions and theories. An evolutionary psychology view is that some forms of fainting are non-verbal signals that developed in response to increased inter-group aggression during the paleolithic. A non-combatant who has fainted signals that she or he is not a threat. This would explain the association between fainting and stimuli such as bloodletting and injuries seen in blood-injection-injury type phobias such as needle phobia as well as the gender differences. Syncope may occur during deglutition. Manisty et al. note: "Deglutition syncope is characterised by loss of consciousness on swallowing; it has been associated not only with ingestion of solid food, but also with carbonated and ice-cold beverages, and even belching." The most common cause of cardiac syncope is cardiac arrhythmia (abnormal heart rhythm) wherein the heart beats too slowly, too rapidly, or too irregularly to pump enough blood to the brain. Some arrhythmias can be life-threatening. Two major groups of arrhythmias are bradycardia and tachycardia. Bradycardia can be caused by heart blocks. Tachycardias include SVT (supraventricular tachycardia) and VT (ventricular tachycardia). SVT does not cause syncope except in Wolff-Parkinson-White syndrome. Ventricular tachycardia originate in the ventricles. VT causes syncope and can result in sudden death. Ventricular tachycardia, which describes a heart rate of over 100 beats per minute with at least three irregular heartbeats as a sequence of consecutive premature beats, can degenerate into ventricular fibrillation, which is rapidly fatal without cardiopulmonary resuscitation (CPR) and defibrillation. Typically, tachycardic-generated syncope is caused by a cessation of beats following a tachycardic episode. This condition, called tachycardia-bradycardia syndrome, is usually caused by sinoatrial node dysfunction or block or atrioventricular block. Aortic stenosis and mitral stenosis are the most common examples. Aortic stenosis presents with repeated episodes of syncope. A pulmonary embolism can cause obstructed blood vessels and is the cause of syncope in less than 1% of people who present to the emergency department. Rarely, cardiac tumors such as atrial myxomas can also lead to syncope. These are relatively infrequent causes of fainting. The most common cause in this category is fainting associated with an acute myocardial infarction or ischemic event. The faint in this case is primarily caused by an abnormal nervous system reaction similar to the reflex faints. In general, faints caused by structural disease of the heart or blood vessels are particularly important to recognize, as they are warning of potentially life-threatening conditions. Among other conditions prone to trigger syncope (by either hemodynamic compromise or by a neural reflex mechanism, or both), some of the most important are hypertrophic cardiomyopathy, acute aortic dissection, pericardial tamponade, pulmonary embolism, aortic stenosis, and pulmonary hypertension. Sick sinus syndrome, a sinus node dysfunction, causing alternating bradycardia and tachycardia. Often there is a long pause (asystole) between heartbeats. Adams-Stokes syndrome is a cardiac syncope that occurs with seizures caused by complete or incomplete heart block. Symptoms include deep and fast respiration, weak and slow pulse and respiratory pauses that may last for 60 seconds. Subclavian steal syndrome arises from retrograde (reversed) flow of blood in the vertebral artery or the internal thoracic artery, due to a proximal stenosis (narrowing) and/or occlusion of the subclavian artery. Aortic dissection (a tear in the aorta) and cardiomyopathy can also result in syncope. Various medications, such as beta blockers, may cause bradycardia induced syncope. Orthostatic (postural) hypotensive faints are as common or perhaps even more common than vasovagal syncope. Orthostatic faints are most often associated with movement from lying or sitting to a standing position, standing up too quickly, or being in a very hot room. The classic example of a combination of these is seen in the frequent fainting by medical students in the operating theatre during observation of surgery. Apparently healthy individuals may experience minor symptoms ("lightheadedness", "greying-out") as they stand up if blood pressure is slow to respond to the stress of upright posture. If the blood pressure is not adequately maintained during standing, faints may develop. However, the resulting "transient orthostatic hypotension" does not necessarily signal any serious underlying disease. The most susceptible individuals are elderly frail individuals, or persons who are dehydrated from hot environments or inadequate fluid intake. More serious orthostatic hypotension is often the result of certain commonly prescribed medications such as diuretics, β-adrenergic blockers, other anti-hypertensives (including vasodilators), and nitroglycerin. In a small percentage of cases, the cause of orthostatic hypotensive faints is structural damage to the autonomic nervous system due to systemic diseases (e.g., amyloidosis or diabetes) or in neurological diseases (e.g., Parkinson's disease). Factors that influence fainting are fasting long hours, taking in too little food and fluids, low blood pressure, low blood sugar, high g-force, emotional distress, and lack of sleep. One theory in evolutionary psychology is that fainting at the sight of blood might have evolved as a form of playing dead which increased survival from attackers and might have slowed blood loss in a primitive environment. "Blood-injury phobia", as this is called, is experienced by about 15% of people. Fainting can occur in "cough syncope" following severe fits of coughing, such as that associated with pertussis or "whooping cough." A hemoglobin count may indicate anemia or blood loss. However, this has been useful in only about 5% of people evaluated for fainting. An electrocardiogram (ECG) records the electrical activity of the heart. It is estimated that from 20%-50% of people have an abnormal ECG. However, while an ECG may identify conditions such as atrial fibrillation, heart block, or a new or old heart attack, it typically does not provide a definite diagnosis for the underlying cause for fainting. Sometimes, a Holter monitor may be used. This is a portable ECG device that can record the wearer's heart rhythms during daily activities over an extended period of time. Since fainting usually does not occur upon command, a Holter monitor can provide a better understanding of the heart's activity during fainting episodes. The tilt table test is performed to elicit orthostatic syncope secondary to autonomic dysfunction (neurogenic). For people with more than two episodes of syncope and no diagnosis on “routine testing”, an insertable cardiac monitor might be used. It lasts 28–36 months. Smaller than a pack of gum, it is inserted just beneath the skin in the upper chest area. The procedure typically takes 15 to 20 minutes. Once inserted, the device continuously monitors the rate and rhythm of the heart. Upon waking from a “fainting” spell, the patient places a hand held pager-sized device called an Activator over the implanted device and simply presses a button. This information is stored and retrieved by their physician and some devices can be monitored remotely. For people with uncomplicated syncope (without seizures and a normal neurological exam) computed tomography or MRI is not generally indicated. Likewise, using carotid ultrasonography on the premise of identifying carotid artery disease as a cause of syncope also is not indicated. Although sometimes investigated as a cause of syncope, carotid artery problems are unlikely to cause that condition. Additionally an electroencephalogram (EEG) is generally not recommended. The San Francisco syncope rule was developed to isolate people who have higher risk for a serious cause of syncope. High risk is anyone who has: congestive heart failure, hematocrit <30%, electrocardiograph abnormality, shortness of breath, or systolic blood pressure <90 mmHg. The San Francisco syncope rule however was not validated by subsequent studies. Other diseases which mimic syncope include seizure, low blood sugar, and certain types of stroke. While these may appear as "fainting", they do not fit the strict definition of syncope being a sudden reversible loss of consciousness due to decreased blood flow to the brain. Recommended acute treatment of vasovagal and orthostatic (hypotension) syncope involves returning blood to the brain by positioning the person on the ground, with legs slightly elevated or leaning forward and the head between the knees for at least 10–15 minutes, preferably in a cool and quiet place. For individuals who have problems with chronic fainting spells, therapy should focus on recognizing the triggers and learning techniques to keep from fainting. At the appearance of warning signs such as lightheadedness, nausea, or cold and clammy skin, counter-pressure maneuvers that involve gripping fingers into a fist, tensing the arms, and crossing the legs or squeezing the thighs together can be used to ward off a fainting spell. After the symptoms have passed, sleep is recommended. If fainting spells occur often without a triggering event, syncope may be a sign of an underlying heart disease. In case syncope is caused by cardiac disease, the treatment is much more sophisticated than that of vasovagal syncope and may involve pacemakers and implantable cardioverter-defibrillators depending on the precise cardiac cause. Fainting in women was a commonplace trope or stereotype in Victorian England and in contemporary and modern depictions of the period. Falling-out is a culture-bound syndrome primarily reported in the southern United States and the Caribbean. 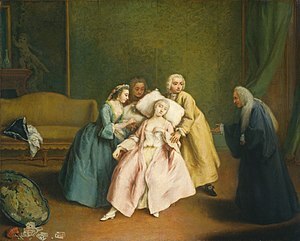 Some individuals occasionally or frequently play the "fainting game" (also referred to in the US as the "choking game"), which involves the deliberate induction of syncope via voluntary restriction of blood flow to the brain, an action that can result in acute or cumulative brain damage and even death. The term is derived from the Late Latin syncope, from Ancient Greek συγκοπή (sunkopē) 'cutting up', 'sudden loss of strength', from σύν (sun, "together, thoroughly") and κόπτειν (koptein, "strike, cut off"). ^ a b c d e f g h i j k l m n o p q r s t u v w x y z aa ab ac ad ae af Peeters, SY; Hoek, AE; Mollink, SM; Huff, JS (April 2014). "Syncope: risk stratification and clinical decision making". Emergency medicine practice. 16 (4): 1–22, quiz 22-3. PMID 25105200. ^ a b c Ruwald, MH (August 2013). "Epidemiological studies on syncope--a register based approach". Danish Medical Journal. 60 (8): B4702. PMID 24063058. ^ a b c Kenny, RA; Bhangu, J; King-Kallimanis, BL (2013). "Epidemiology of syncope/collapse in younger and older Western patient populations". Progress in Cardiovascular Diseases. 55 (4): 357–63. doi:10.1016/j.pcad.2012.11.006. PMID 23472771. ^ Kaufmann, H; Bhattacharya, K (May 2002). "Diagnosis and treatment of neurally mediated syncope". The Neurologist. 8 (3): 175–85. doi:10.1097/00127893-200205000-00004. PMID 12803689. ^ Gaynor D, Egan J (2011). "Vasovagal syncope (the common faint): what clinicians need to know". The Irish Psychologist. 37 (7): 176–9. hdl:10147/135366. ^ Bracha HS (July 2006). "Human brain evolution and the 'Neuroevolutionary Time-depth Principle:' Implications for the Reclassification of fear-circuitry-related traits in DSM-V and for studying resilience to warzone-related posttraumatic stress disorder". Prog. Neuropsychopharmacol. Biol. Psychiatry. 30 (5): 827–53. doi:10.1016/j.pnpbp.2006.01.008. PMID 16563589. ^ Manisty C, Hughes-Roberts Y, Kaddoura S (July 2009). "Cardiac manifestations and sequelae of gastrointestinal disorders". Br J Cardiol. 16 (4): 175–80. Archived from the original on 11 June 2013. Retrieved 11 May 2013. ^ a b Freeman, Roy (2011). "Chapter 20: Syncope". In Longo, Dan L.; Kasper, Dennis L.; Jameson, J. Larry; Fauci, Anthony S.; Hauser, Stephen L.; Loscalzo, Joseph (eds.). Harrison's Principles of Internal Medicine (Textbook) (18th ed.). New York, NY: The McGraw-Hill Companies. pp. 171–177. ISBN 978-0-07-174889-6. ^ Oqab, Zardasht; Ganshorn, Heather; Sheldon, Robert (September 2017). "Prevalence of pulmonary embolism in patients presenting with syncope. A systematic review and meta-analysis". The American Journal of Emergency Medicine. doi:10.1016/j.ajem.2017.09.015. ^ Nallamothu BK, Mehta RH, Saint S, et al. (October 2002). "Syncope in acute aortic dissection: diagnostic, prognostic, and clinical implications". Am. J. Med. 113 (6): 468–71. doi:10.1016/S0002-9343(02)01254-8. PMID 12427495. ^ Jamjoom AA, Nikkar-Esfahani A, Fitzgerald JE (2009). "Operating theatre related syncope in medical students: a cross sectional study". BMC Med Educ. 9: 14. doi:10.1186/1472-6920-9-14. PMC 2657145. PMID 19284564. ^ "Swoon at the Sight of Blood? Why the sight of blood might make you faint -- and what you can do about it". Archived from the original on 2015-09-06. Retrieved 2015-08-15. ^ Dicpinigaitis PV, Lim L, Farmakidis C (February 2014). "Cough syncope". Respiratory Medicine. 108 (2): 244–51. doi:10.1016/j.rmed.2013.10.020. PMID 24238768. ^ Moya A, Sutton R, Ammirati F, et al. (November 2009). "Guidelines for the diagnosis and management of syncope (version 2009)". Eur. Heart J. 30 (21): 2631–71. doi:10.1093/eurheartj/ehp298. PMC 3295536. PMID 19713422. ^ Shen, Win-Kuang; Sheldon, Robert S.; Benditt, David G.; Cohen, Mitchell I.; Forman, Daniel E.; Goldberger, Zachary D.; Grubb, Blair P.; Hamdan, Mohamed H.; Krahn, Andrew D.; Link, Mark S.; Olshansky, Brian; Raj, Satish R.; Sandhu, Roopinder Kaur; Sorajja, Dan; Sun, Benjamin C.; Yancy, Clyde W. (March 2017). "2017 ACC/AHA/HRS Guideline for the Evaluation and Management of Patients With Syncope". Journal of the American College of Cardiology. doi:10.1016/j.jacc.2017.03.003. Strickberger, S. A.; Benson, D. W.; Biaggioni, I.; Callans, D. J.; Cohen, M. I.; Ellenbogen, K. A.; Epstein, A. E.; Friedman, P.; Goldberger, J.; Heidenreich, P. A.; Klein, G. J.; Knight, B. P.; Morillo, C. A.; Myerburg, R. J.; Sila, C. A.; American Heart Association Councils On Clinical Cardiology (2006). "AHA/ACCF Scientific Statement on the Evaluation of Syncope: From the American Heart Association Councils on Clinical Cardiology, Cardiovascular Nursing, Cardiovascular Disease in the Young, and Stroke, and the Quality of Care and Outcomes Research Interdisciplinary Working Group; and the American College of Cardiology Foundation: In Collaboration with the Heart Rhythm Society: Endorsed by the American Autonomic Society". Circulation. 113 (2): 316–327. doi:10.1161/CIRCULATIONAHA.105.170274. PMID 16418451. Moya, A.; European Society of Cardiology (ESC); Sutton, R.; European Heart Rhythm Association (EHRA); Ammirati, F.; and Heart Rhythm Society (HRS); Blanc, J.-J. ; Endorsed by the following societies; Brignole, M.; European Society of Emergency Medicine (EuSEM); Moya, J. B.; European Federation of Internal Medicine (EFIM); Sutton, J.-C.; European Union Geriatric Medicine Society (EUGMS); Ammirati, J.; Blanc, K.; European Neurological Society (ENS); Brignole, A.; European Federation of Autonomic Societies (EFAS); Dahm, M.; Deharo, M.; Gajek, T.; Gjesdal, R. R.; Krahn, F.; Massin, A.; Pepi, J. G.; Pezawas, E. P.; Ruiz Granell, W.; Sarasin, H.; Ungar, D. G.; et al. (2009). "Guidelines for the diagnosis and management of syncope (version 2009): The Task Force for the Diagnosis and Management of Syncope of the European Society of Cardiology (ESC)" (PDF). European Heart Journal. 30 (21): 2631–2671. doi:10.1093/eurheartj/ehp298. PMC 3295536. PMID 19713422. ^ "American Epilepsy Society Choosing Wisely". www.choosingwisely.org. Retrieved 30 August 2018. ^ Quinn J, McDermott D, Stiell I, Kohn M, Wells G (May 2006). "Prospective validation of the San Francisco Syncope Rule to predict patients with serious outcomes". Ann Emerg Med. 47 (5): 448–54. doi:10.1016/j.annemergmed.2005.11.019. PMID 16631985. Lay summary – Journal Watch (July 21, 2006). ^ Birnbaum A, Esses D, Bijur P, Wollowitz A, Gallagher EJ (August 2008). "Failure to validate the San Francisco Syncope Rule in an independent emergency department population". Ann Emerg Med. 52 (2): 151–9. doi:10.1016/j.annemergmed.2007.12.007. PMID 18282636. ^ "'Choking Game' Becoming Deadly Fad For Adolescents". WJZ-TV Baltimore. 2005-11-04. Archived from the original on 2007-12-19. Retrieved 2008-02-13. Look up fainting in Wiktionary, the free dictionary.